To understand a dangerous process must understand several concepts. A dangerous process is immersed in a work process. A worker process is an activity with means or tools on an object (or subject, as appropriate) to a final target (either product or service). The entire process of work is carried out under a working environment and under certain organizational conditions (hour, shift, time-outs, etc.). After understand a work process, the dangers that are present in each of the elements of the work process (object or subject, media, business, ultimate goal, environment and organizational conditions) should be analyzed. Hazards can be classified as safety hazards (eg, inadequate demarcation for the passage of hoist in a warehouse or bad wiring channeled in an office), hygienic hazards (eg noise exceeding 85 dB (A) Leq 8 hours in a warehouse or inadequate lighting in an office) and lack of ergonomics hazards or nonergonomics (eg, improper lifting weight in a warehouse or inadequate design job in an office). After established hazards in the work process, we can proceed to call them: dangerous processes. Once certain hazardous processes, it is necessary to quantify, usually to establish if they are within the range of what is tolerable or not tolerable. Once quantified (either qualitative or quantitative methodology) risks are renamed. We can define "risk" as the probability of an unfavorable outcome as a result of exposure to an event that can be casual, incidental or unsafe. With the risks (or dangerous processes categorized) we can move to raise the controls, which the LOPCYMAT should be initially at the source (source of the problem), then the atmosphere (between the origin of the problem and the worker) and finally the worker (through personal protective equipment, organizational controls, training, etc.). Controls at the worker must be the last alternative presented after the employer to justify the above control levels can not be implemented. Taken from the document management system of the SST: a tool for continuous improvement of the International Labour Organization (2011). Medicina Laboral de Venezuela C.A. recommended that safety and health at work is treated by multidisciplinary personnel as mandated LOPCYMAT (occupational medicine, hygiene, ergonomics and safety), which allows for better outcomes and reduce costs by mismanagement of resources. Recognition of hazardous processes receives various names according to professionals and the training school. The most appropriate assessment would be jobs. 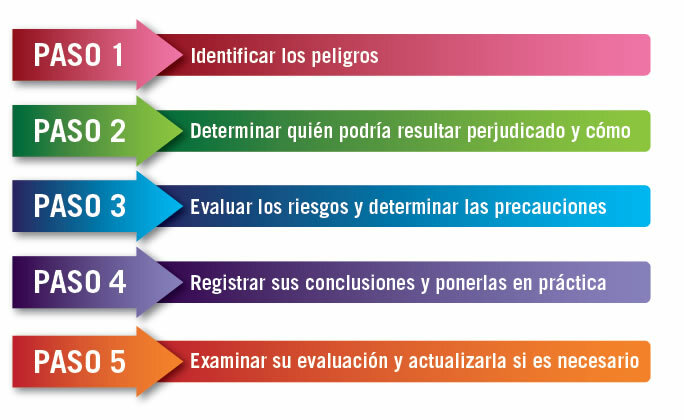 Other professionals and schools use terminology such as risk analysis, risk matrices and risk assessment. Providing it is a multidisciplinary study (hygiene, ergonomics and safety) are equal. For the purposes of LOPCYMAT and Regulations, is very important that any assessment of jobs with due notification of risks to each worker and that this signal strong knowledge in the letter of notification of risk. It is also essential to have training or require the employee in the performance of their duties (16 hours for quarterly training). Physical: noise, heat stress, inadequate lighting, ionizing and non-ionizing radiation, pressure (decompression) and others. Chemicals: chemical that can be asphyxiating, irritant, carcinogenic, mutagenic, teratogenic and others. Biological: by-products of the human body (blood, urine, feces, saliva, etc. ), by animals, microorganisms in the environment and others. And psychosocial nonergonomics: by inadequate conditions in terms of postural, metabolic, mental, lifting load, organizational and other cargo. The INPSASEL maintain a national registry of Departments of Health and Safety at Work, this registration will be valid for three years renewable. The registration process has not yet begun. Importantly, any accident the worker must be reported by the employer within 24 hours in which the accident occurs or when you have some knowledge of the occurrence of the accident and / or diagnosis. It must be carried in the statement made ​​by the INPSASEL formats, considered as not made, that statement that does not meet the requirements of the format. If knowledge of the accident is through the worker or another person, it is important to establish the degree of relationship or nexus with the employee, the name of who makes the notification and identification number. When the legislature are referred to accidents are those that occur inside or outside of work, during working hours. The Departments of Health and Safety at Work shall develop and maintain a system for monitoring the use of leisure time. Also, submit quarterly monitoring reports of the use of free time in the formats developed for this purpose (compliance with labor hours, holidays, days of mandatory rest days conventional break and overtime not exceeding those established by the law).